Flying Fisherman® Polarized Sunglasses are designed by fishermen for fishermen, and are a quality alternative to expensive eyewear. Flying Fisherman® launched its line of polarized eyewear in 1985 after years of research and development in the Florida Keys, our home base since 1972. The extreme sun and harsh conditions in the Florida Keys, along with the tremendous variety of game fish, provide the best fishing opportunity in continental America, and phenomenal product testing grounds. During the production of our sportfishing TV programs, polarized camera lenses were used to reduce glare and capture the action. Sight fishing and deep-water action revealed the obvious need for polarized eyewear as well, just as local sportfishing professionals needed polarized sunglasses to do their daily job. Add the three big reasons for "turn over" -- glasses being lost, scratched, or broken -- and we discovered a need for quality, affordable, polarized eyewear. Every fishing environment out there, except for ice fishing, is available in the Florida Keys…from gin clear to brackish brown water, the deep blue Atlantic, sand and grass flats, and more. 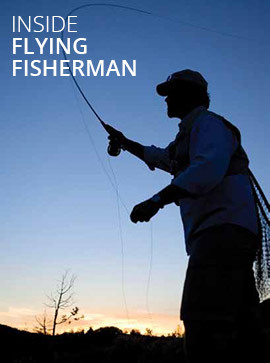 It's here that top sportfishing professionals assist us every day in field testing and developing new products...before we put the Flying Fisherman® brand name on them. 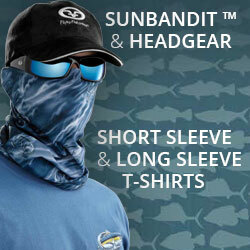 Flying Fisherman Sunglasses are designed to provide quality, affordable polarized eyewear. More than 45 frame styles and a variety of AcuTint™ Sunlens options make up the collection from classic, traditional models to sleek wrap-around designs and mirrored lens treatments, Flying Fisherman sunglasses are both stylish and fully functional and offer uncompromising performance and value. Glare is caused by light waves reflected off surfaces like water, sand, snow and pavement.Flying Fisherman AcuTint™ lenses have a polarizing filter to absorb horizontal glare with minimal color distortion, enhance depth and clarity, and reduce eye fatigue. They provide maximum protection from UVA and UVB rays, and meet or exceed FDA, ANSI and European (CE) standards for general purpose eyewear. Flying Fisherman Sunglasses are offered in three durable lens materials. 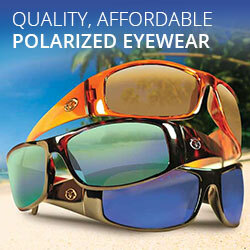 The color of the sunlens is critical to the ability of our sunglasses to perform under various conditions. Flying Fisherman's AcuTint™ sunlens system offers the most effective lens tints in the color spectrum. The Flying Fisherman® AcuTint™ polarized lens coloring system uses a select blend of pigment to enhance color contrast without distorting natural color. It also sharpens visual acuity, reduces eye strain and eliminates glare. Smoke - A gray tint best for bright, sunny conditions like fishing deep water, lakes and offshore. The most natural lens color that doesn't distort colors. Amber - A comfortable brown tint that's excellent for shallow water fishing, bright sun and overcast conditions. Enhances depth perception. Yellow-Amber - Great for extremely flat or low light conditions like early morning or late evening. Sharpens visual acuity and increases contrast. Vermillion & Copper - Red based tints that provide excellent contrast and depth perception in low or flat-light conditions, and are favored for sight fishing and muddy water for maximum color definition. Green Mirror - Our amber lens with a multi-layered, green mirror coating that reflects glare away from the eyes. Works well in either bright sun or low light. Blue Mirror - Our smoke lens with a multi-layered, blue mirror coating that adds a stylish look and extra glare reflection. Best for bright sunny conditions. Red/Gold Mirror - Our vermillion lens with a multi-layered, golden red mirror coating that adds style and extra glare reflection. Excellent for low light conditions.